Meghan Krein's parents always said, "I'll give you something to cry about!" Mostly because she's a baby. So she figured, why not draw on her experiences and maybe help all of the other babies out there. But really, deep down she believes we all just want to connect - on some level. It's why we hang out at happy hours, go to support groups, or log into Facebook. We just want to feel - something. Good or bad, an emotion surging through our system let's us know we're still breathing and if we're feeling it, someone else is too. 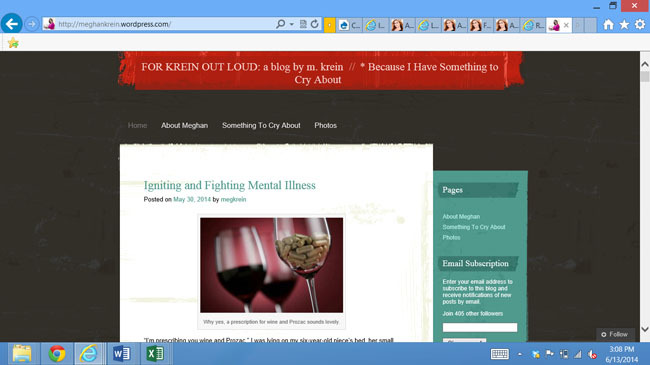 So that's what For Krein Out Loud is all about - to let you know you're not alone.